Following a week of retrospective reviews of exemplary AACM recordings, it seemed a fitting coda to talk about this great new album from drummer Jack DeJohnette and otherwise Chicago related musicians, saxophonists Henry Threadgill and Roscoe Mitchell, pianist Muhal Richard Abrams and cellist Larry Gray. 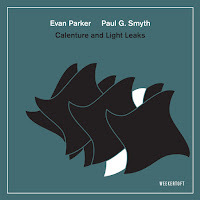 For the most part, the members of this group has been a part of all the new approaches to jazz since the mid-1960s and one way to see this recording is as a reaffirmation of their gifts as composers, players and musical visionaries. 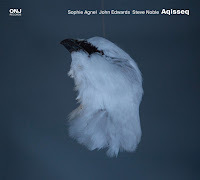 Another way is to see it as a celebration of Jack DeJohnette reconnecting with his friends with whom he played, aged 19, in Abrams' Experimental Band in Chicago. In the mid-1960s, DeJohnette moved to New York City, while most of his collaborators here - Threadgill, Mitchell, and Abrams - went on to the AACM. Adding cello and bass here is Larry Gray who has been an influential member of the Chicago scene. 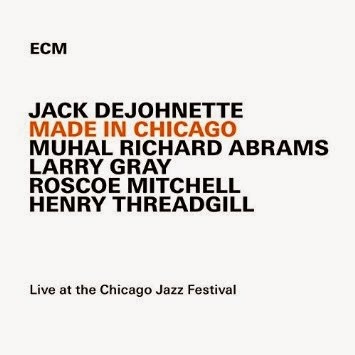 Brought together by DeJohnette to perform at a show at Millennium Park in August 2013, the resulting album, captured live, sounds pristine and vibrant. The excitement and energy of the concert is caught, as is their precision and exceptional musicianship. 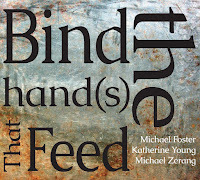 The recording starts with the Mitchell composition 'Chant', which starts quietly and builds into a cyclical tune with a repetitive chant of horns, punctuated by the piano. Then, a solo by Abrams the favor is returned by the saxophones who deliver snippets of the 'chant'. Halfway through, a piercing woodwind delivers a reedy solo that veers inside and out of the lines. Parrying with the drums, tension mounts as the others drop out. It's a highly effective track and an indicator of the quality of music to follow. Another early highlight is Abrams' 'Jack 5', composed as a tribute to the drummer who brought the group together. 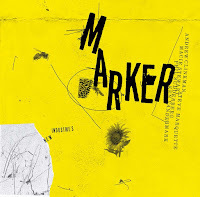 The track burns slowly, with DeJohnette's impressionistic percussion providing the backbone where he plays with the time, masterfully stretching out sections. 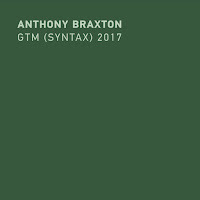 Gray's bass builds the tension that underscores the more delicate melodic snippets that come and go. The Threadgill penned 'Leave Don't Go Away' comes to life with a slightly sinister vibe. It is a thick mix of drum and bass with feature some fascinating flute work - in fact there is a late 1960's fusion vibe to the intro groove. Abrams' piano is present almost throughout and his playing is delightfully angular. The woodwind solo towards the end has some sharp edges. Through the tracks there is a great deal of energy and surprise that is executed with a masterful touch. A collective improvisation called 'Ten Minutes' closes the recording. It begins with a repetitive pattern from the piano, quickly joined by the two saxophones, circular and buzzing with energy, the song rumbles along for a joyful six minutes. Made in Chicago is a beautifully recorded album and helps celebrate the continuing vitality of the AACM 50 years after its founding by showcasing some of its founding members. Great record! My favorite tracks on it are the two Roscoe Mitchell compositions. By the way, Angel City, his latest album, which was released on Rogueart a few months ago, is also very good. 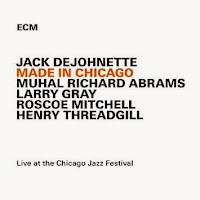 DeJohnette, Mitchell, and Threadgill have all independently made many much better recent recordings than this one. Great recording. Thank you for the info. Roscoe Mitchell is wonderful on this.